Scarlet Ibises have slightly webbed feet and a thin, down-curved bill. They fly with the bill forward and neck held straight. All ibises are long-legged and long-necked wading birds. The scarlet color of this 22 inch long bird fades when the bird is deprived of its natural food but addition of shrimp to the zoo diet helps to restore the color. The bill is like that of a curlew. Females and males are identical in coloration, but the male's body size and bill length are much larger. Once pursued by hunters for its brilliant plumage and reputed good-tasting flesh, the scarlet ibis is now protected. 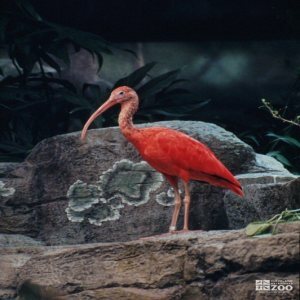 In 1961, 24 South American scarlet ibis eggs were placed in American white ibis nests in Florida. Seventeen hatched and years of cross-breeding between the scarlet and white ibises has produced pink ibises and other hybrid shades. The range of the scarlet ibis is northern South America, and southeast Brazil. Scarlet ibis inhabit tropical coasts and littorals, mangrove swamps, tidal flats, muddy estuaries, and dense cane brakes. The scarlet ibis is a highly communal species. It is social both during nesting and when searching for food. The scarlet ibis will fly in large flocks between different feeding and roosting sites. In flight, the birds will soar and also glide at great heights and speeds. If disturbed, sometimes all the birds of a nesting area will take flight at once. Territorial disputes between males are settled by size. They forage for food by either probing in water with their long bills or pecking for prey items on soil surfaces. The scarlet ibis has a colonial and social breeding system. Nests are generally built close to one another with more than one per tree. This is most likely done to reduce the risks of predation. Males use displays of preening, flights, head rubbing, and a rocking motion to attract mates. A female must be cautious when approaching a male, because he may actually attack her if she does not remain in his display area. Scarlet ibises are polygynous, the males often mate with more than one female. They begin visiting their colonial nesting sites by mid-September and egg-laying takes place between early November through December. The first egg is laid 5 to 6 days after copulation, and there are usually 3 to 5 eggs in each nest. Eggs are not glossy, but are smooth. Chicks fledge after 35 days and are independent in 75 days.